Telepresence physicians have been predicted since Hugo Gernsback foresaw the “radio doctor” in the 1920s. HealthSpot of Dublin, Ohio takes this idea a step further with its HealthSpot Station. It’s a telepresence kiosk that acts as an alternative to the traditional doctor’s office. In the United States, there is increasing pressure on the health system, yet the Association of American Medical Colleges predicts that by 2025 there will be a physician shortage of 130,000. 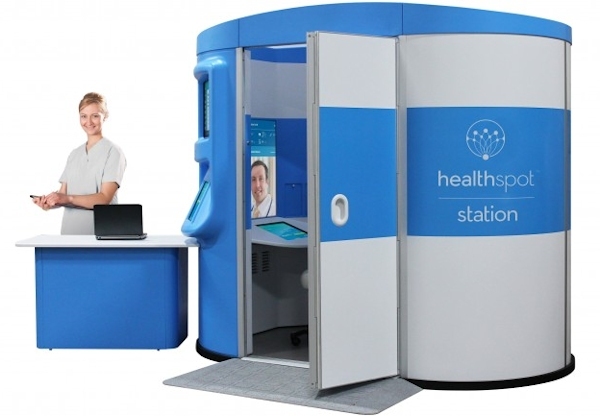 Billed as a telehealth system, the HealthSpot Station is a telepresence kiosk designed to take pressure off a beleaguered health care system by providing a private area where acute care patients can speak to a physician over a high-definition video conference system. It’s purpose is to act as an alternative to urgent care centers and emergency rooms while giving physicians a way to use their time more efficiently. There is an attendant on duty to answer questions and provide assistance and inside the kiosk is a suite of digital instruments to aid diagnosis, such as a pulse oximeter, blood pressure cuff, dermascope, patient touchscreen, video conference screen, otoscope and stethoscope. In addition, there are antibacterial surfaces and UV-C lighting. HealthSpot sees the kiosk being used in a wide variety of locations including grocery stores, hospitals, doctors and specialists offices, emergency rooms, large businesses, rural communities, military bases, schools, nursing homes and remote villages in developing countries. The [2:08 minute] video on YouTube introduces the HealthSpot Station.